Since 2007 I have been supporting the international charitable organization EveryChild. 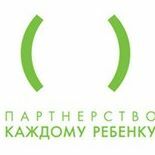 Since 2009 I have been on the supervisory board of the nonprofit organization “Partnership for Every Child”, which leads the projects of EveryChild in Russia. “Partnership for every child” is an autonomous nonprofit organization, which helps children and families in difficult life situations in order to prevent separation of children and their parents, creates new social services for children and families in Russia and promotes the best global and Russian practices for prevention of social orphanhood. Our vision: a world where every child lives in a safe and loving family, which is capable of providing him/her with everything necessary for life and development. We help families and children stay together. Your donation will allow us to help a larger number of families. They get this help for free. Through donations we are able to pay professional families for their work. You can send a text message, make an online donation or leave some money in one of the boxes that are located at our trustworthy partners. Helping is easy!